With a record-breaking 100 ‘Open’ entrants, the Hideaway Beach Club on Marco Island crowned champions in the following divisions: Men’s and Women’s 3.0, 3.5 and 4.0 levels. We have recognized the winners, finalists and consolation winners in each category. For the second consecutive year, the rain interrupted our Sunday morning schedule but did not affect the awesome tennis displayed on court. There was stellar play throughout the weekend with outstanding performances in each division. Upsets were rampant in the men’s 4.0 category with newcomers Mike Piro (former University of Richmond soccer star) and talented Island Club assistant pro, Eric Sonnenberg stunning the field with their quick reflexes and patient play over the 2-event. For the second year in a row, 4.0 women’s ‘champ’ Jackie Pham won again but this time with her talented lefty partner Rachel Schenk. Sally Abramo and fellow Hideaway Beach friend, Jackie Heise, played some of their best tennis of the season as they won two out of three matches, claiming second prize. In the women’s 3.5 winners Carrie Masci and Noreen Pitts (new partners from Wolfboro, New Hampshire) edged the team of Coe and Thompson with persistent lobs and consistent ground strokes throughout their 90 minute match. In the men’s 3.5 division, good buddies Toby Burr and Ken Kotowski, teammates from Massachusetts, displayed incredible shot-making as they knocked off the tough Fiddler’s Creek duo, Gary Dunston and Bruce Sonneman. In the women’s 3.0 group, Gainesville teenage star, Ibit Scott and on-the-rise Margaret Kimberly of Hinsdale, Illinois and Hideaway Beach were overpowering as they defeated the pesky team of Nicki Davis and Robin Rafferty. Finally in the men’s 3.0 tournament, University of Michigan standout Dave Goldfarb and Syracuse star Dan Edinger dazzled the crowd with precise ground strokes and great defense as they beat their good friends from Hideaway Beach John Ferguson and Steve Mattingly to claim the crown. 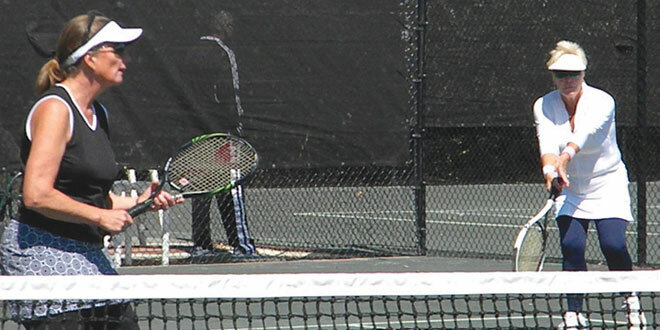 In the consolation events, Bob Slack and Island Club friend played their best tennis of the weekend knocking off good friends Brock Wilson and Steve Zinkan. The outstanding play continued in the women’s 3.5 league as close friends Diana Smith and Sherry Vanstone of Hideaway Beach won their fight. In the men’s 3.5 group, former Hideaway Beach Open champ Monson Douglas teamed up with Hammock Bay buddy Alphonse Pitre to win. In the women’s 3.0 consolation division, Claire Babrowski and fellow Hideaway Beach friend, Stephanie Schwetz played incredible tennis edging their fellow club members Liz Bryan and Cathy Teghtmeyer 7-5, 7-5 in a super match. Finally, in the men’s 3.0 event, Fiddler’s Creek stars Paul Morency and Larry Regnier snuck by the tough Hideaway duo of Jerry Sitner and Rick Smith. Doug Browne is the Hideaway Beach Tennis Director and the new Collier County USPTA Pro of the Year. Additionally, Doug has been the International Hall of Fame Director of Tennis this past summer. Doug has been writing a tennis column for the past fifteen years and welcomes your feedback.